PORT OF SPAIN – A Sub-Regional Consultation for the Caribbean towards a Global Compact for Safe, Orderly and Regular Migration (GCM) is being held today in Trinidad and Tobago. The two-day event began yesterday. Hosted by the Government of Trinidad and Tobago, these consultations are organized by IOM, the UN Migration Agency, with the financial support of the European Union. 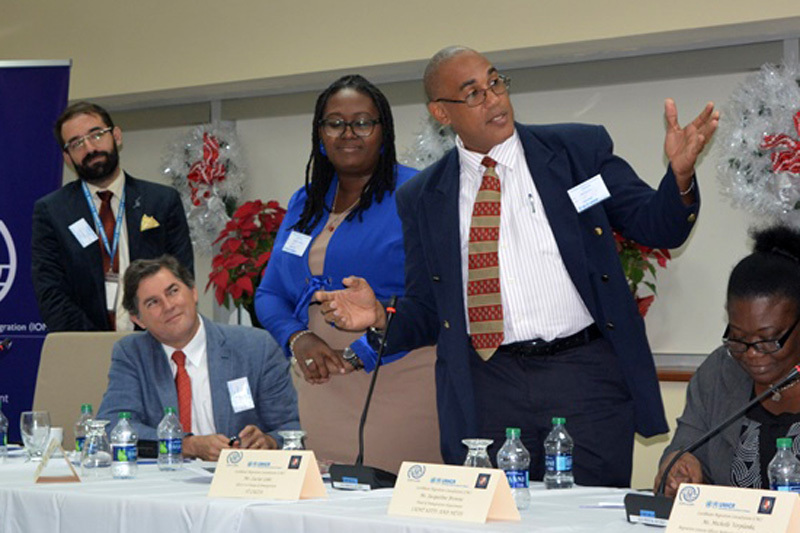 The event brought together government representatives from Bahamas, Barbados, Dominica, Grenada, Guyana, Jamaica, Saint Lucia, and Trinidad and Tobago. Economic Commission for Latin America and the Caribbean (ECLAC) representatives also participated in the planning and attended the event. The purpose of this meeting is to ensure that the experiences regarding migration governance in the Caribbean, a region which has been shaped by migration throughout its history, are considered during the development of the GCM. For the Caribbean countries and territories, climate change and migration are a growing challenge, and a GCM could be a useful tool to meet it. Dominica registered a surge of 3,000 applications for first-time passport holders during the first ten days after hurricane Maria devastated the island. As hurricanes get stronger and more frequent in the Caribbean, its effects on sub-regional migration will increase. Due to the heterogeneity of the region, the two-day consultation covers a wide range of topics, including the analysis of common and unique themes related to migration in the Caribbean and the identification of the main principles and commitments to recommend for negotiations of the GCM. It is expected that the discussions will result in a regional report based on the inputs provided by each participating country. “These consultations will allow participants to openly discuss migration within a regional space, as well as to coordinate and promote information exchange in the Caribbean,” said Marcelo Pisani, IOM Regional Director for Central America, North America and the Caribbean. The Caribbean is one of the few regions in the world which does not have a collective forum on migration, where countries can discuss and identify common issues and interests, as well as differences.